The history of Botany Bay goes back thousands, if not tens of thousands, of years. Prior to the visit by the first white men 1770, Botany Bay was already home to a number of Aboriginal tribes, Kameygal and Gweagal. One of reasons the Kooris thrived here was the abundance of marine life present in and around the Bay. In 29 April 1770, Lieutenant James Cook, R.N., in HM Bark Endeavour entered Botany Bay and stepped ashore at Kurnell. Cook and his crew, including the famous scientist Sir Joseph Banks, explored the area of the bay and first named it Stingray Harbour because of the large number of rays they caught here. Cook and his crew stayed eight days and then headed north. He later renamed it Botany Bay due to the vast array of new flora and fauna that Banks and his assistant, Solander, found here. Europeans were not to visit Botany Bay for another 18 years, but in January 1788 two separate European fleets visited the Bay within days of each other. The first to enter was the First Fleet under the command of Captain Arthur Phillip of the Royal Navy on 18 January 1788. He stayed until the morning of 26 January when he moved his fleet to Sydney Harbour. On 26 January while sailing the short distance from Botany Bay to Sydney Harbour, Captain Phillip sighted the French navigator Jean-Francois de Galaup, Comte de Laperouse off the coast in his ships La Broussole and L'Astrolobe. Later that day, Laperouse entered Botany Bay. He stayed almost 6 weeks and departed on 10 March 1788. Nothing further was ever heard of Laperouse and his men until 1827 when an Irish trader and adventurer, Captain Peter Dillion, heard from islanders about a wreck 40 years previously on the island of Vanikoro in the Solomon Islands. In the 1950s, Reese Discombe, a New Zealander, discovered the remains of one of the ships confirming Laperouse's fate. Of interest is the fact that Discombe also was one of the pioneer divers on the wreck of the SS President Coolidge in Vaunuatu. Luckily history, Laperouse had entrusted to Captain Phillip a copy of his logbook which is our only knowledge of that part of his trip until he came to Australia. Items of the equipment carried by the expedition and pieces of the ships can now be seen in the Laperouse Museum in the old Cable Station in the suburb of La Perouse on the Botany Bay shore. A replica of an anchor from L'Astrolobe is also on display at the Laperouse Monument and nearby is the grave of Pere Receveur, a Catholic priest who died on 17 February 1788 from injuries received earlier in the voyage. One of the results from Laperouse's visit to Botany Bay is the fact the the suburb where he stayed has been called La Perouse (yes, a slightly different spelling) and the beach on the western side of the suburb is called Frenchmans Bay. 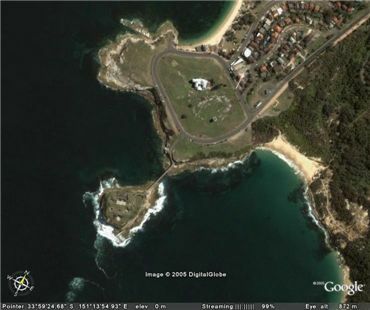 La Perouse has some of the best diving in Sydney and is certainly the most popular location for diving in Sydney, if not New South Wales. Bare Island is located here and there are many different dives you can do around the island. Other places you can dive are the mainland either side of the bridge to the island. This article is about diving the bay on the mainland to the west of the Bare Island Bridge. This is basically the section of mainland between the bridge and La Perouse Point, although as far as I know (and I have lived in the area or dived La Perouse since 1960) both the point and the bay do not have a proper name. Note that in mid-2006 Fisheries referred to the bay as Astrolobe Bay in a press release about the sinking of some fish attraction dives. To do this dive, I would suggest doing it as a "drift" dive, even though you might not have any current (caused by the tide). In any case, the tides seem to flow in one direction on one part of the dive and then the opposite direction at the other end of the dive. Despite this, the tidal flow is never too strong to cause a problem. The best place to start is on Bare Island just to the west of the bridge. Park near the road that leads down to the bridge (just west is best). Gear up and walk across the bridge and down onto the rock platform. Cross under the bridge and you will see a small boat ramp (used before the bridge was built to transport people and goods to the island). Once in the water, head north till you drop to the sand at about three metres. Keep going till you hit a reef. Turn left and follow the reef edge to the north-west. Almost straight away you should see a large rock that stands a little off the main reef. Have a careful look around here as sea horses can be found in this area. The reef edge is a small wall in this area about a metre high. The depth here is still about three metres. From here continue swimming along the reef. You will basically head north-west, but may go a bit to the north at times. Along the way there are some small boulders off the reef and a few small overhangs. The depth increases very slowing to about 10 metres. Keep a look out for blue ringed octopus as you go, as well as pineapplefish (knightfish) which may be seen under the overhangs. 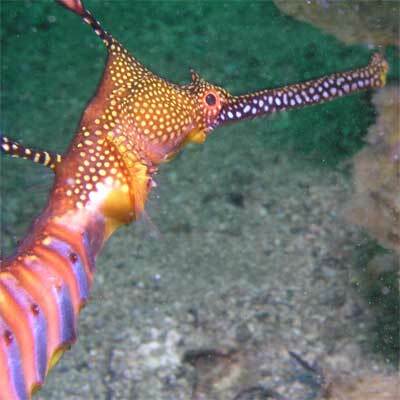 You may also see more sea horses on the sea squirts or sponges. Also look for red indianfish on the sand or near the sponges. The sponge and sea squirts are very colourful along this section of the dive. After about 20 minutes you will start to turn to the west. This means you should be at the head of La Perouse Bay. Anywhere from here you will be able to safely and easily exit onto the rock platform. The depth will remain about 10 metres from here right to the end of the dive, although it may come up a metre or two at times. The reef turns a bit to the south and runs in a south-westerly direction. The wall gets more prominent along this section, up to four metres high. There are more small rocks off the reef here and some overhangs on the wall.There are normally some sea dragons along here and at night you normally see squid. Soon you will see some larger rocks on the reef. These form gullies between the wall and the rocks. After about 40 minutes, you should probably head back along the direction you have already come as you should be past La Perouse Point and need to come back towards the point to be able to exit. After a couple of minutes, turn to the north and come up the wall. The depth comes up to seven metres. If after more than a minute you have not come to the rock platform, turn to the east and continue in this direction till you reach the shore. There are a number of excellent exit spots here. From the exit point, walk back across the grassed area and then back up the road to your car. This is really quite a good dive, but can be affected by the poor visibility. Also note that there are some crazy fishers in this area. In January 2005 I was hit on the head by a beer bottle thrown by a fisher who did not like us diving while he was fishing.